First Wearable Device for Incontinence - Notifies You When It’s Time to Go to the Bathroom. 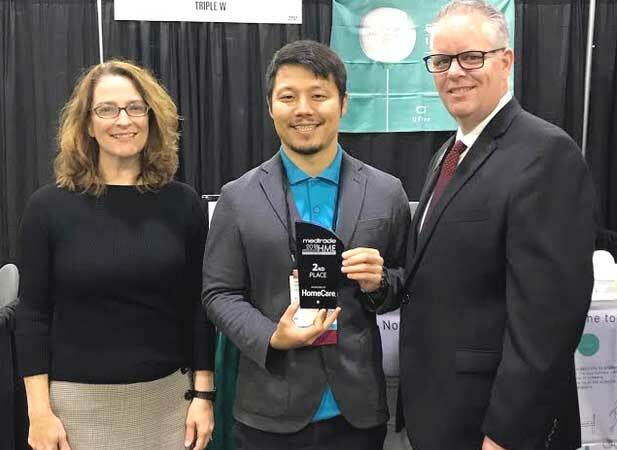 SAN DIEGO, October 24, 2018 – Triple W, an innovator of connected health devices, was awarded second place at this year’s Innovative HME Retail Product Awards for DFree®, the first wearable device for incontinence that notifies the user via a smartphone or tablet when it’s time to go to the bathroom. With DFree, seniors, children and disabled people with bladder control issues have a convenient and cost-effective alternative to disposable diapers or pads and medications. DFree gives them freedom to live an active lifestyle with peace of mind from accidents. The Innovative HME Retail Product Awards are sponsored by HomeCare Magazine and honor home medical equipment (HME) products that are suited for retail sale. The awards competition was held during Medtrade, the largest HME trade show and conference in the U.S., Oct. 15-17, 2018 at the Georgia World Congress Center in Atlanta. The purpose of the retail awards competition is to promote and recognize products that contribute to providers' bottom lines through cash sales. All entries were judged on their contribution to the quality of life, and how well they would work in a retail environment. Products were also judged on: marketing support provided to suppliers, innovation, functionality, quality/durability, aesthetics/style, ease of retail, set-up and pricing.